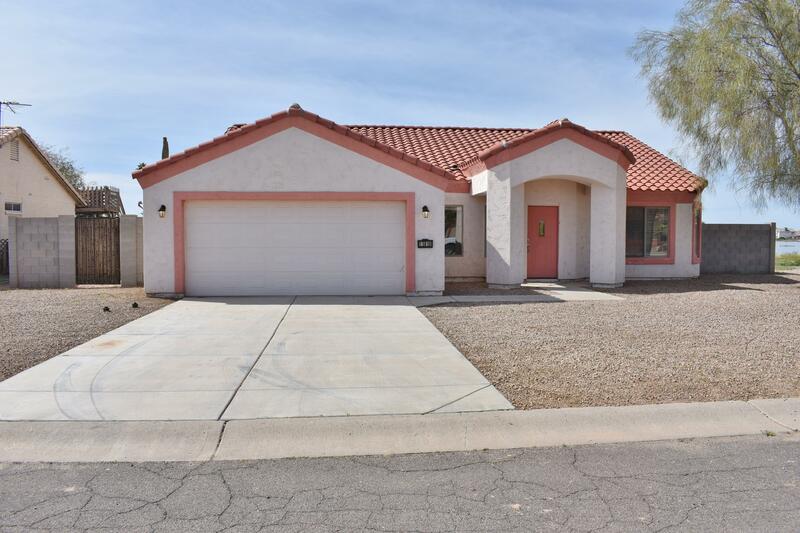 All Arizona City homes currently listed for sale in Arizona City as of 04/25/2019 are shown below. You can change the search criteria at any time by pressing the 'Change Search' button below. 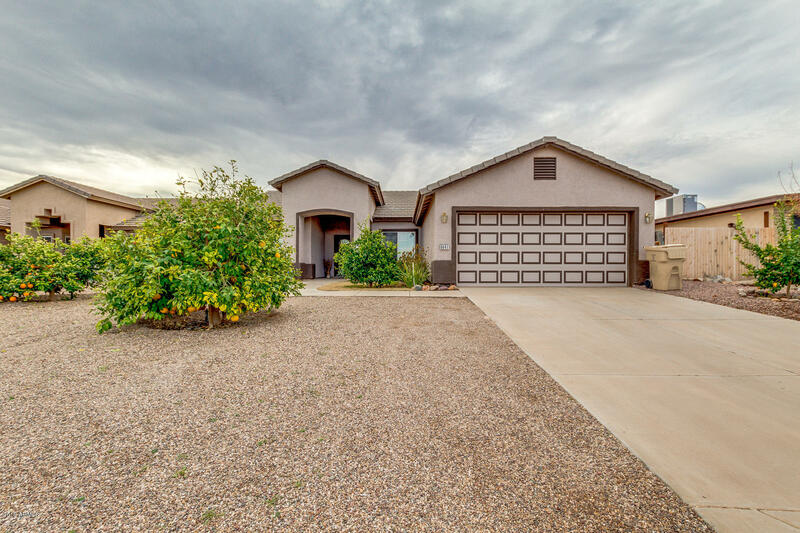 If you have any questions or you would like more information about any Arizona City homes for sale or other Arizona City real estate, please contact us and one of our knowledgeable Arizona City REALTORS® would be pleased to assist you. "EXCEPTIONAL CUSTOM HOME!! With every detail attended to. 9' walls T/O, vaulted ceilings in LR, built in entertainment center w/ back lighting, electric fireplace, TV, stereo + built in sound system in LR & patio. Custom paint, gorgeous Plantation Shutters, upgraded hardware, plumbing & light fixtures. Fantastic Island kitchen w/granite counters, extra deep kitchen sink, breakfast bar, 42''Custom Cherry Cabinetry, walk in pantry, work station, built in hutch off dining + all appliances convey. " "YOUR HOME IN THE SUN! 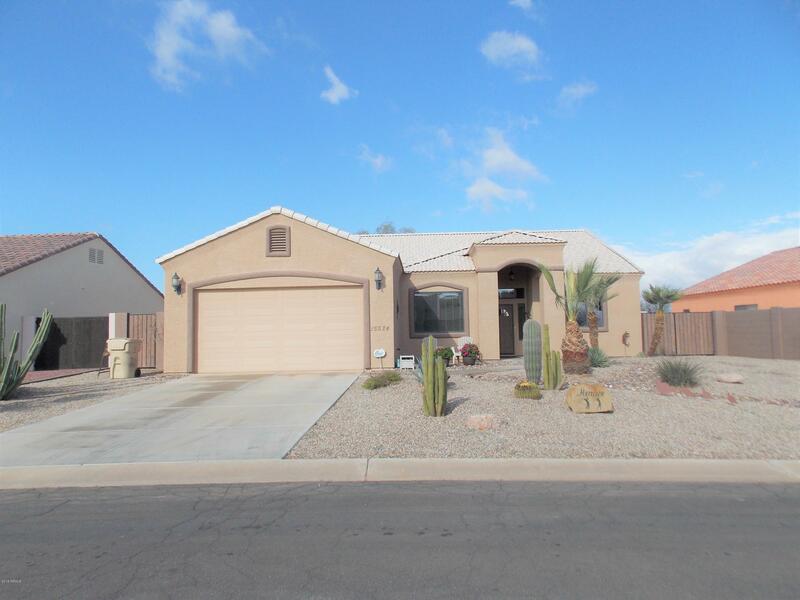 Custom built 4 bdrm 2 ba with over 2300 sq ft. (pinal county says 2825 sq. 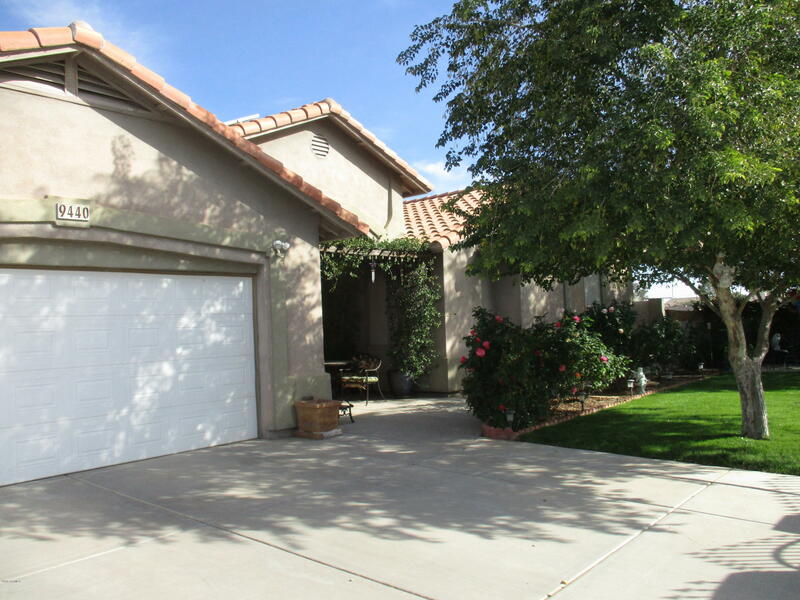 ft) and a 30x38 oversized garage w/temperature controlled storage rm & rough in for bath. Spacious entry w/archway and columns to living/dining area. 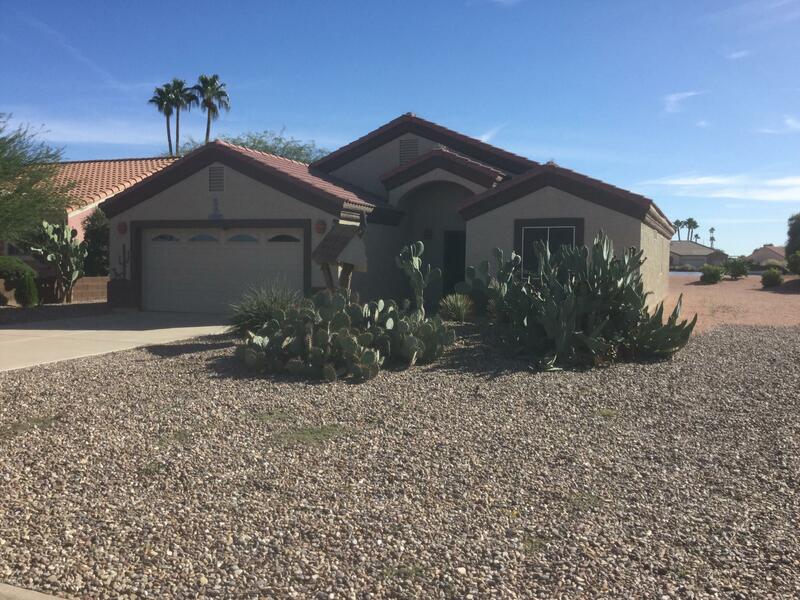 Arcadia doors to back covered patio and large yard w/mature landscape. Split floor plan. Master bath has separate tub/shower, double sinks & private toilet rm. Kitchen with all appliances and breakfast bar. Security system (Monitor & cameras) rem"
"Picture yourself living here! Spacious home with backyard ready for entertaining. 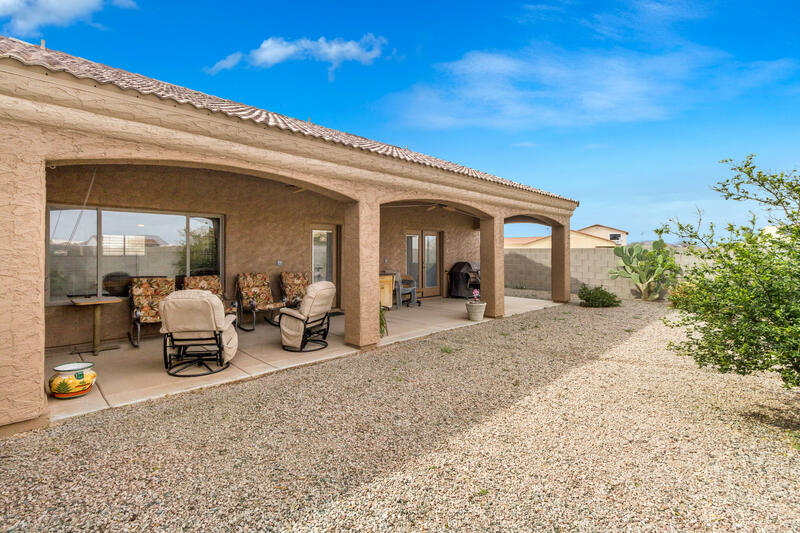 This 3BDRM/2BA + den home sits on over 1/3 acre with flagstone patio, pool/spa, built in BBQ, firepit, lower deck, spiral staircase to upper deck w/hot tub (check out the views). Split floorplan. MBR w/french & security doors to back patio. Kitchen w/breakfast bar, pantry and all appliances. Dining area w/arcadia doors. Arched openings from dining to living. White plantation shutters. Custom paint thru ou"
"DOUBLE LOT! (over 15500 sq ft). Gorgeous semi custom 4 bedroom, 2.5 bath with over 2600 sq ft. in park like setting. 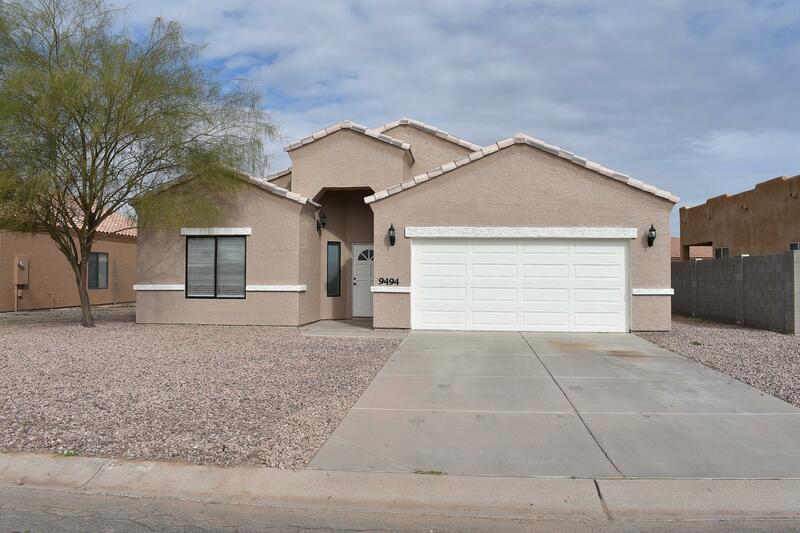 Enjoy the split floor plan w/built in computer area, spacious kitchen with granite, SS appliances, island, upgraded cabinets. Family room. Tile floors with insets except bedrooms. 9-12' ceilings, ceiling fans, whole house exhaust. Master bath has separate shower, jetted tub, double sinks and walk-in closet. Covered front and back patios. 16x16 storage building plumbed for "
"Beautiful home, in a cul-de-sac! This lovely single level, 2 bedroom, 2 bathroom home with a huge den and a 3 car garage is move in ready! RV gate on left-hand side of home. Save money with energy efficient solar panels. Property has a welcoming entry that leads to the open living space. Beautiful kitchen features granite countertops, stainless-steel appliances. Bedrooms are spacious, the master bedroom has an ensuite bathroom with a beautiful walk-in shower. Large backyard has nice covered porc"
"This home is a must see! 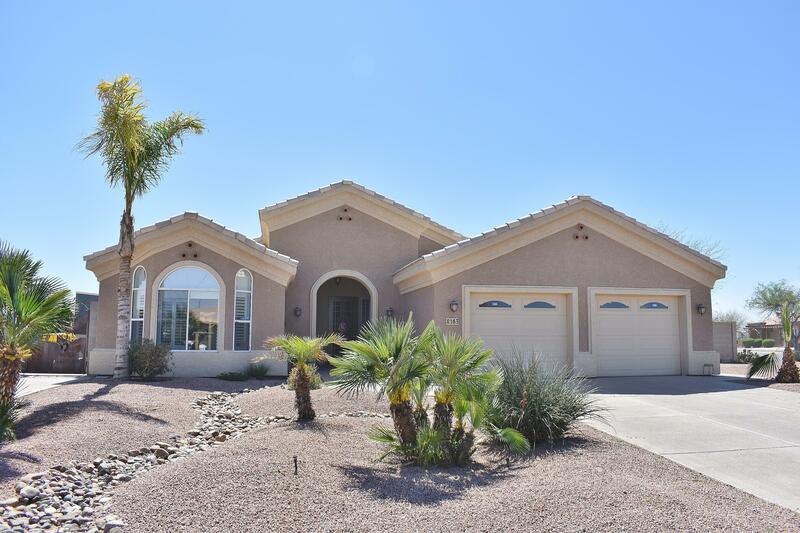 There is so much space to roam in this beautiful 2400sf home w/4 bedrooms & Bonus Room. Owners have made many beautiful upgrades just this year alone. Wood grain tile in kitchen, dining, living areas, hallway, entry way & one of the bedrooms. Gorgeous glass tile backsplash in kitchen, Barn door to laundry room, 24''x24'' tile in master bath ,clock wall. 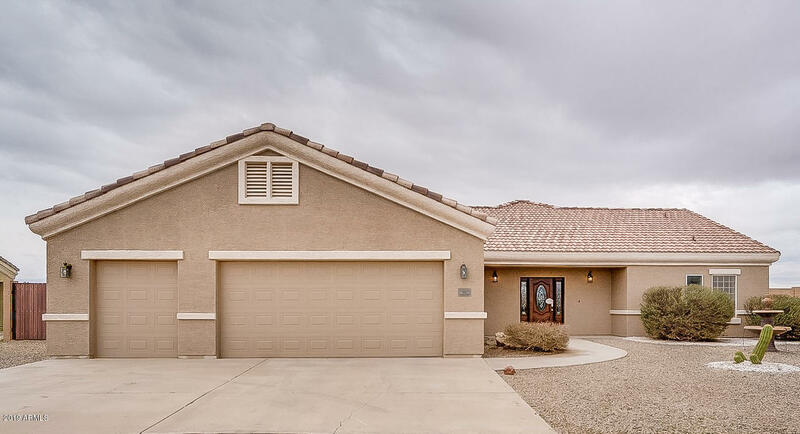 Home sits on a Double sized lot totaling 13,000+sf along w/2 double gates, Pergola & covered patio great for entertai"
"Stunning home on Paradise Lake!! This Semi-Custom Show Home is in Turn key condition, just bring your tooth brush. 2 Master Suites with a split floor plan everyone desires plus a 3rd Br and bath. Gorgeous views from the Family Rm/LR overlooking Paradise Lake from the picture windows. Breakfast Bar in the fully equipped kitchen and lovely bay window in dining room. Open floor plan and immaculate inside and out. Beautifully landscaped front and back, with walk ways, planter area and extended p"
"GOLF COURSE LOT ON 7TH FAIRWAY. Gate access to fairway & covered golf cart parking at rear of 3rd car garage. Enjoy the beautiful 22x44 diving pebble tech pool with baja steps and larage water fall and above ground hot tub. Extra storage in two 10x10 Weather King Sheds and two large Rubbermaid sheds. 16X40 covered metal RV carport. Pergolas in front and back of your home! Extra 12'' insulation added in roof, security doors and sunscreens on all windows. Large 8-ft. corian island in kitche"
"Situated across the street from Paradise Lake, this well maintained home has 2157 sqft w/ 3 bedrooms plus den, 2 full baths, & open floor plan great for entertaining! 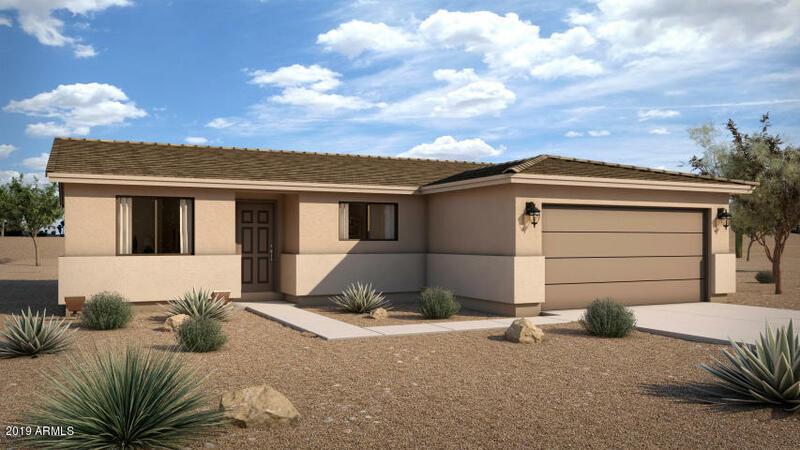 Features include tile thru-out, vaulted ceilings, split bedroom plan, ceiling fans, easy care landscaping, & sunscreens. The large master has an exit to the back patio, bath w/ double sinks, separate shower & tub, & a spacious walk in closet. The great room is large & open to the spacious kitchen & dining. Upgraded cabinets, Corian"
"MUST SALE! 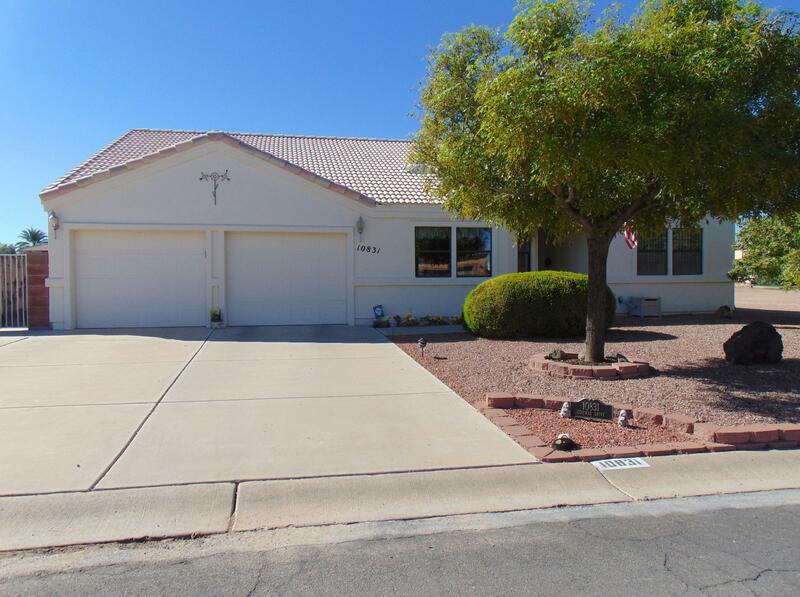 Gorgeous freshly painted 3 BR, 2 BA custom built home with 3 car garage, new sprinkler system & lush grass! This N/S facing home comes with newer appliances throughout including fridge, washer, dryer, RO system & water heater The spacious great room boasts amazing lake views from the large windows, 2 kitchen bars, 2 inch blinds & security doors. 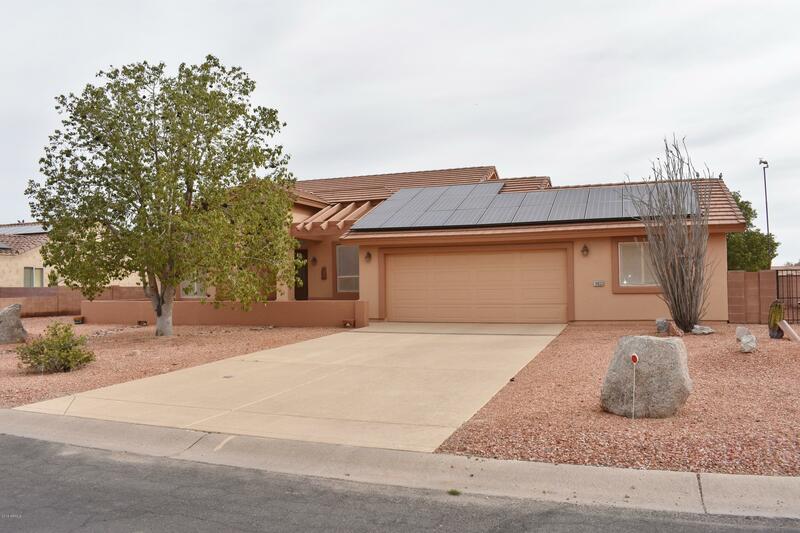 This home comes fully wired, ceiling fans, recessed lighting, security system, and 2 garage openers. The large master bedroom features en"
"New Construction! This home has 3 Bedrooms 2 Bath. Kitchen features Granite counter tops and breakfast bar. Lot's of cabinets and plant shelves. Stainless steel appliances with built in microwave. Upgraded faucets and fixtures. Ceiling fans throughout. Nice views from big picture windows. Beautiful laminate flooring and carpet in bedrooms. 3 Car Garage. Upstairs Bonus room 480 sq ft., access from Garage. Storage room, etc. Amazing huge 900 sq ft covered back patio with ceiling fans. Inspection"
"LIVE the LIFE ! 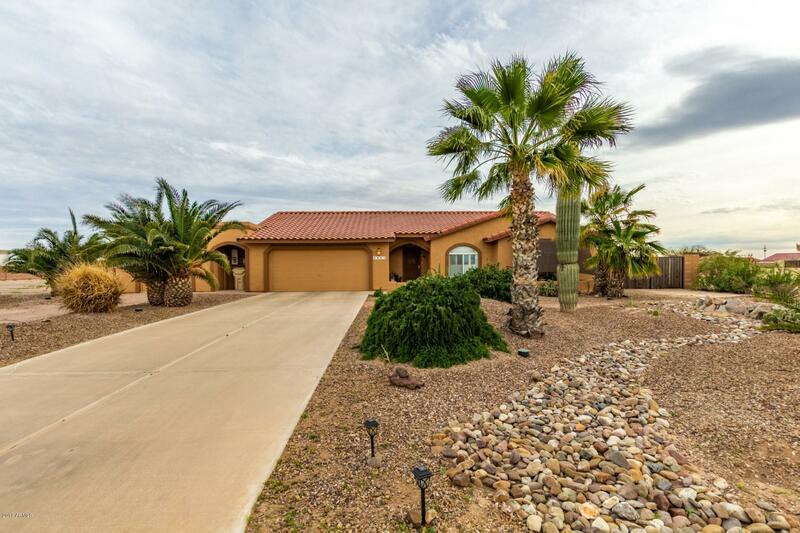 In this fabulous CUSTOM 3 Br Home on the 12th Fairway of the Arizona City Golf Course. Enjoy your coffee watching the sunrise and golfers on the huge patio or the shade in the afternoon. Lots of curb appeal with the courtyard entrance where you will enter the Great Room with fantastic panoramic views of the golf course. Island kitchen and breakfast bar, custom cabinets, pantry with roll out drawers. desk/work area, stainless steel appliances including the refrigerator. Maste"
"Gorgeous!!! This home is waiting for you to move in. Fully furnished home. All furnishings included for the exception of the items in the garage. Upgraded kitchen cabinets, island counter and breakfast bar. All appliances included. Lots of airy space & sunshine portrays throughout this home. Living/Dining open area with door out to back extended covered patio. Den/office area a plus. Over sized Master bedroom with fireplace and Arcadia doors to back yard. 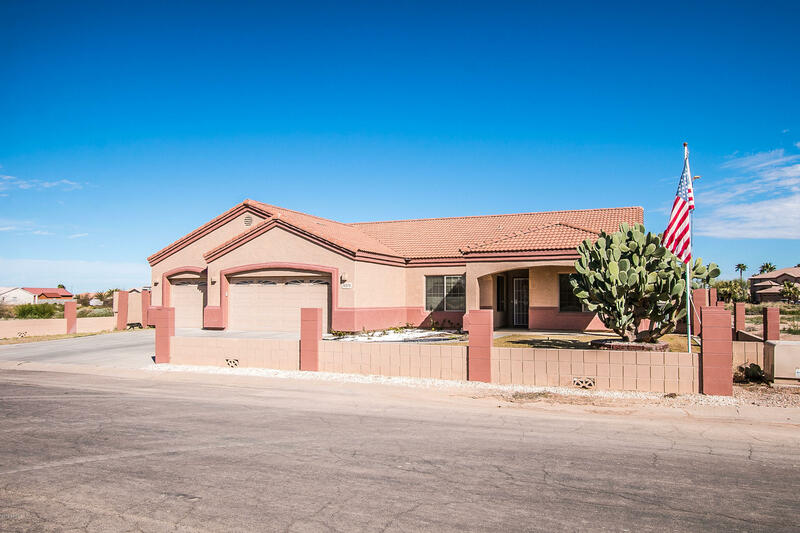 Master Bathroom has separate shower & G"
"Move in ready home on the 17th hole in Arizona City Golf Course. Open floor plan boasts 2 bedroom, office/den, and pool/craft room. Modern kitchen is complete with recessed lighting, ample storage, and granite counter tops. Over-sized lot features resort like backyard with lake view, golf course views, large patio, and private pool. Gated RV parking, huge 3 car garage with a 20' x 30' separate garage space/workshop! All this plus a quiet neighborhood centrally located to shopping and all your "
"AMAZING REMODELED HOUSE MOVE IN READY!!!! 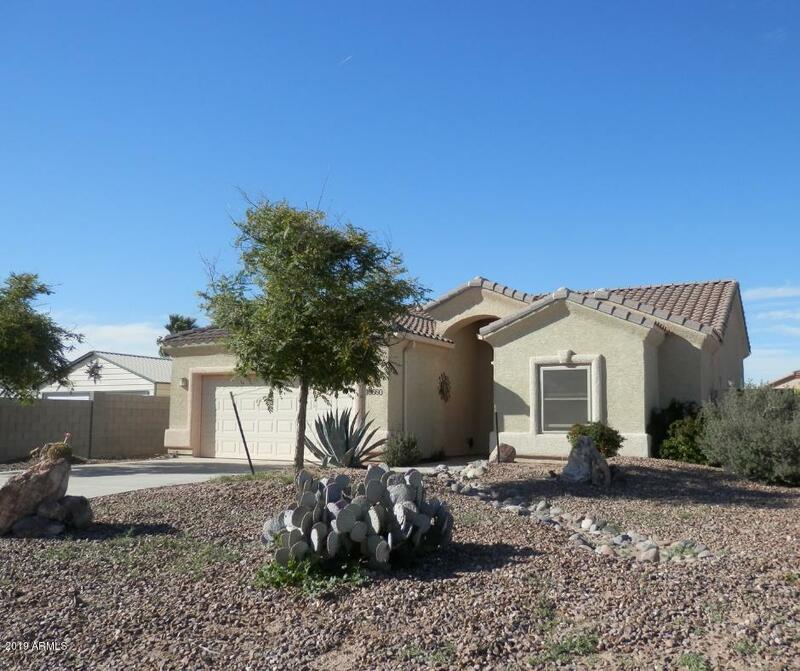 4 bed/2.5 baths comes with an open den downstairs and a large loft upstairs. New porcelain floor tile, new carpet convenient darker color for the more traffic area, new paint in and out, granite kitchen counter tops, walking pantry, electrical garage door, new LED lighting features throughout the house, granite bathroom sinks, new patio door, new gravel front and back, New RV gate. ALL OFFERS ARE WELCOME AND WILL BE CONSIDER BY SELLER........Thanks for "
"REDUCED Lake Front Property! Lake Assoc. maintained. FURNISHED-3 BR, 2 BA home with over 1,512 s/f. 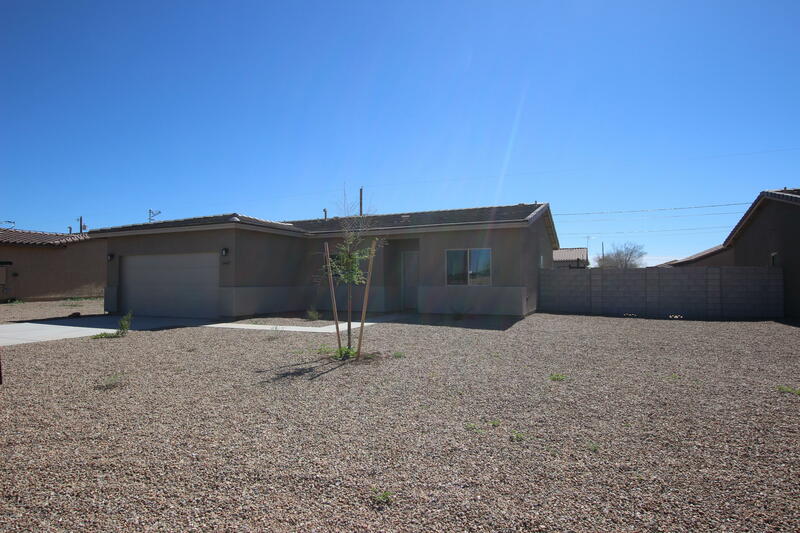 Walk into the open floor plan with 2 bedrooms off to the right with full bathroom in between. The spacious Living Room & Fire Place give you a sense of ''Home'' all year round. Beautiful tile flooring though out heavy traffic areas. Enter the kitchen in the great room and enjoy the kitchen island, nice cabinets, and newer appliances. Gazing out the sliding door at the beautiful lake with wild life"
"MOVE IN READY LAKEFRONT PROPERTY starting with new paint and flooring inside. Open split bedroom floorplan with vaulted ceilings gives you the feeling of space. Add ceiling fans, plant shelves and pass through between the living room and a large eat in kitchen with a spacious dining area. Kitchen also features lots of cabinets and counter space. Master bedroom has a walk in closet. Situated in a cul-de-sac on a large pie shaped lot with beautiful views overlooking Paradise Lake. 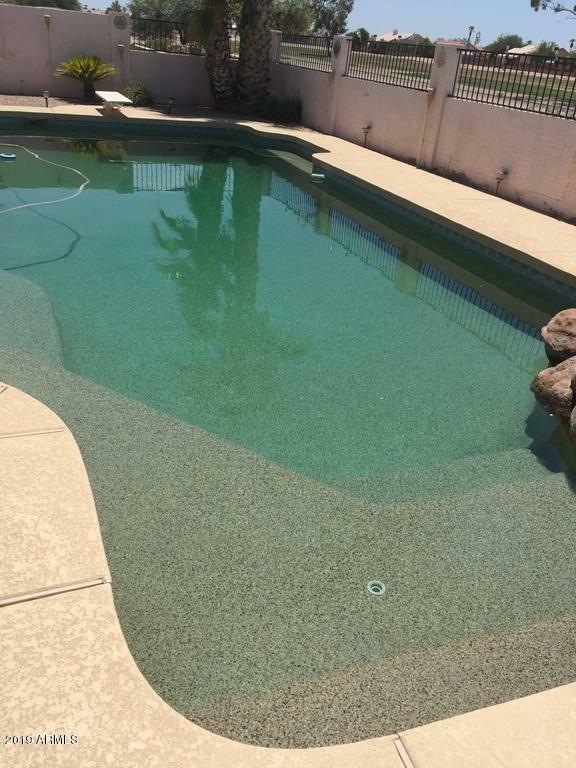 In addition y"
"Looking for a cozy home with a pool? Come and make an appointment to view this 3 bedroom and 2 bathroom home. 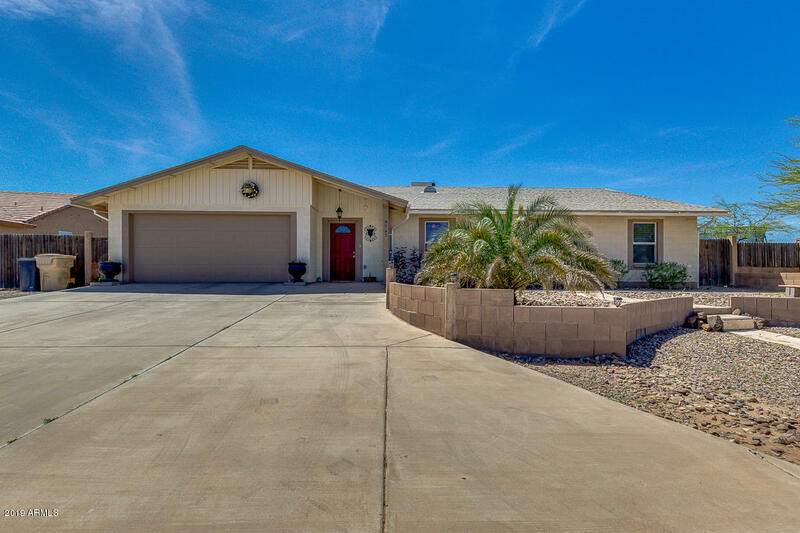 This home offers a split floor plan with carpet and tile throughout. In 2017 the windows were updated to dual pane. Front and backyard are both landscaped. Backyard has fruit bearing citrus trees. Appliances such as stove, fridge, washer and dryer are included with the home." 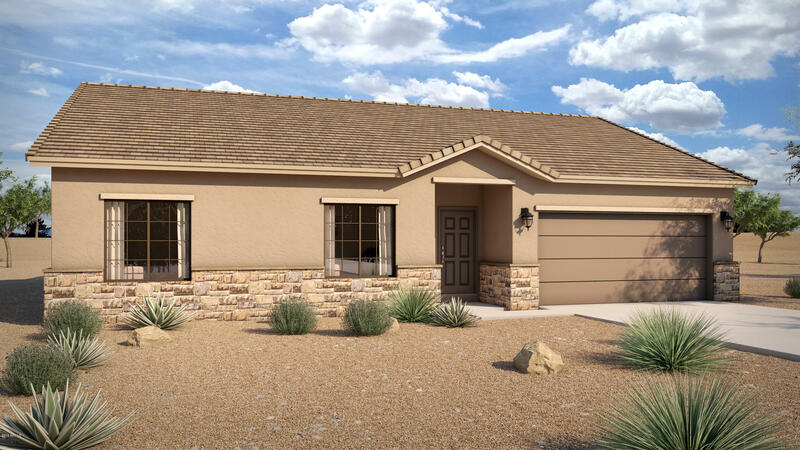 "Under construction, one of our most popular floor plans the Mesquite. Offering 1575 (Cholla) SF. Nice foyer entrance into a nice bright open living room/Kitchen area, separate laundry room with access to 2 car attached garage. Master Bedroom/ Bathroom, Tile plank flooring, double pane vinyl windows, cathedralize insulation in attic. Truly a turn key home!" "Upgraded and priced to sell! Must see 2,037 sq. 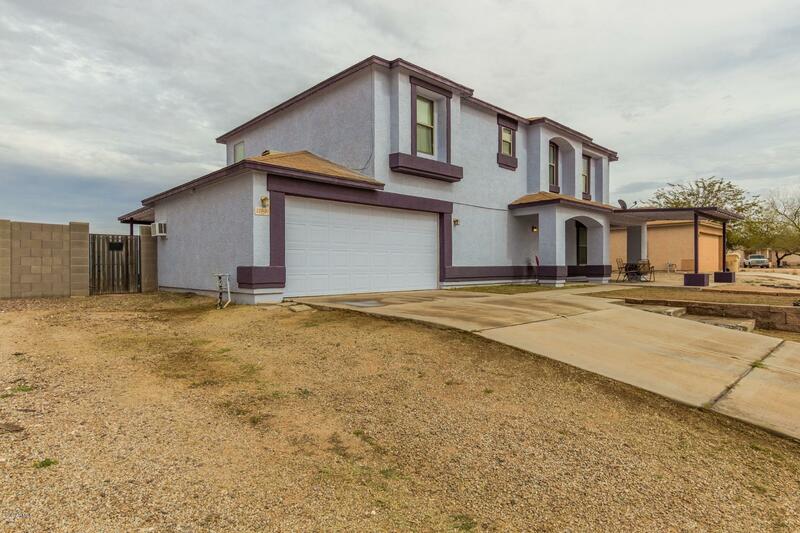 ft. 4 bedroom, 2.5 bath two-story *plus* upstairs loft, minutes away from schools, shopping, and dining in Arizona City. Spacious backyard with firepit and storage shed. Covered patio, 2 car garage and convenient indoor laundry. Interior features include custom carpeting, 20'' tile, pre-installed ceiling fans, window treatments and contemporary 2-tone paint. Gourmet kitchen boasts side breakfast room, breakfast bar/island, walk-in pantry, cabinetr"
"This is the perfect home for those wanting to make a move to a wonderful home with tons of upgrades inside and out! 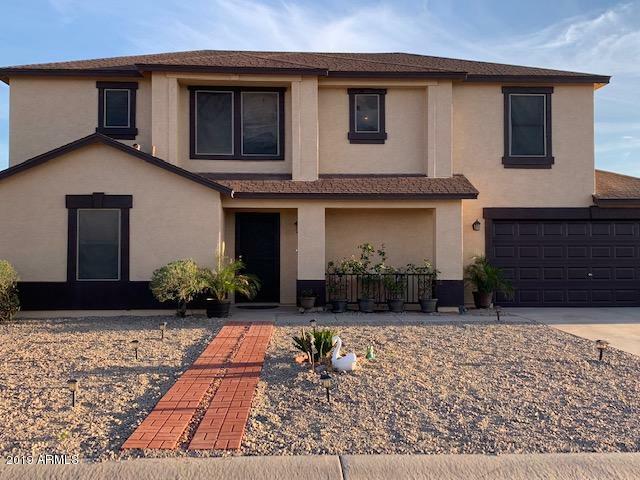 Featuring citrus trees & sweet curb appeal. The beautiful great room floor plan has living & dining areas, vaulted ceilings, designer paint, 3 bed, 2 bath, and tons of natural light. Lovely kitchen includes black appliances, cabinet/counter space, pantry, and recessed lighting. Fabulous master suite offers his & her mirror closets and full bath with dual sinks. Serene backyard has "
"NEW PAINT INSIDE AND OUT!! Take a look at this move in ready split 4-bedroom home. Open floorplan with spacious great room, dining and ISLAND kitchen. Kitchen features lots of counter space, new range and built in microwave plus breakfast bar. Tile flooring in kitchen, dining, baths and traffic areas. Almost new carpet in master bedroom and great room, installed Oct. of 2018. Laminate wood flooring in bedroom 2,3, and 4. Master bedroom has exterior door to back patio and walk in master closet." "SOON TO BE COMPLETED SPEC HOME! 3 bedroom, 2 bath, 2 car garage. Open split floorplan. Master suite with generous vanity and large walk-in closet. Concrete tile roof. Room for RV parking. 14 S.E.E.R. AC unit, R-38 attic insulation. NO HOA! FHA, VA, USDA Financing. 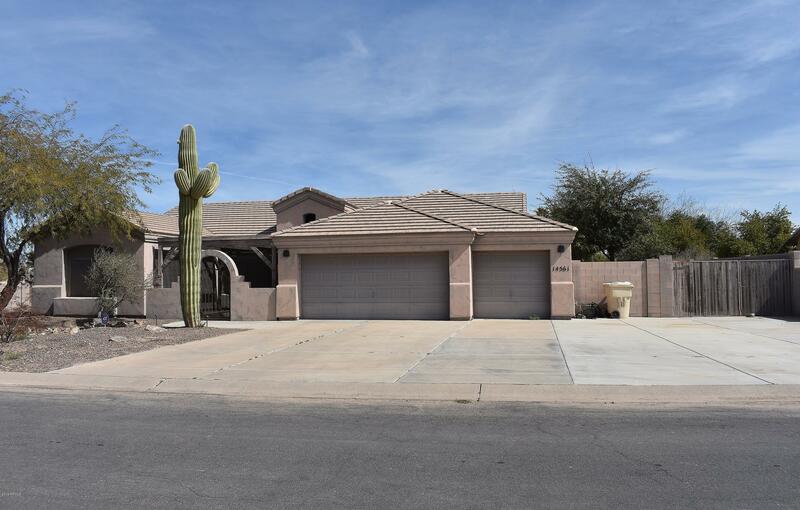 Arizona City offers numerous amenities including IGA grocery, Convenience stores, Post Office, several local restaurants, Library, Golf course. 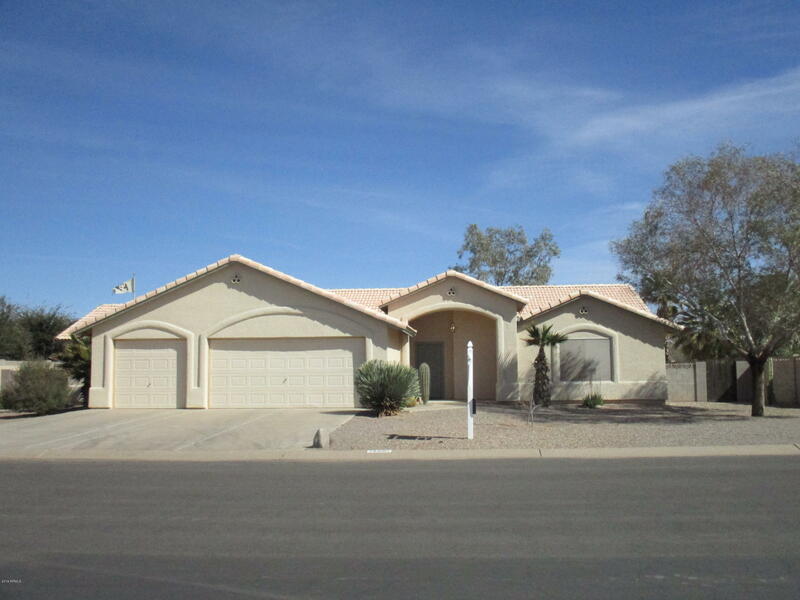 Arizona City is conveniently located 3 miles from I10. 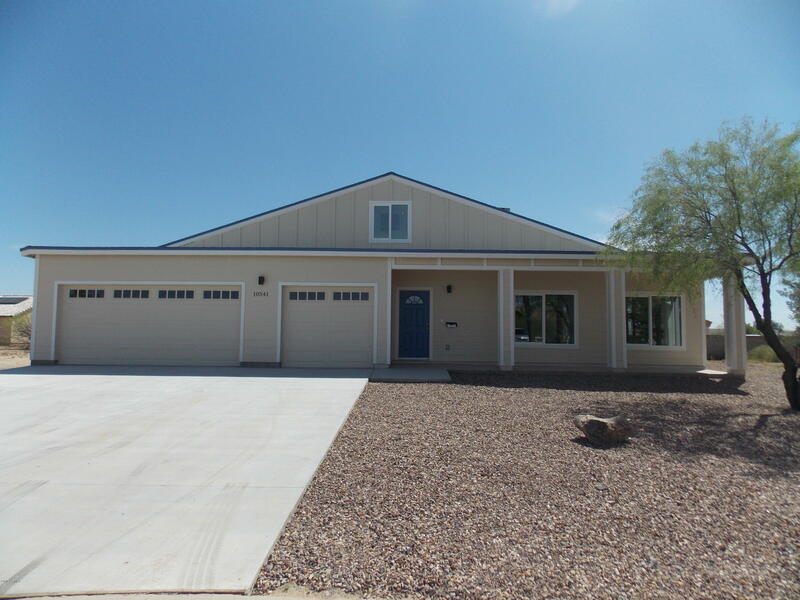 Photo's are of another co"
"Under construction, one of our most popular floor plans the Mesquite. Offering 1354 SF. Nice foyer entrance into a nice bright open living room/Kitchen area, separate laundry room with access to 2 car attached garage. Master Bedroom/ Bathroom, Tile plank flooring, double pane vinyl windows, cathedralize insulation in attic. Truly a turn key home!"